You should still be able to enable Bluetooth through the top bar applet. Or check out ibm-acpi - IBM ThinkPad ACPI Extras Driver -- some reports suggest that ibm-acpi includes bluetooth control (amongst other nice things). But I don't have the hardware so I'm completely unable to verify these claims. Good luck. Actually changing /etc/bluetooth/main.conf was enough for me. It was enough for me, although the article describes some other steps that may or may not be necessary. On Ubuntu 17.04 and older the option was named InitiallyPowered. Save the file and restart - Bluetooth should now be disabled. This will do the trick, but only in older Ubuntu versions using upstart. Now the file /etc/rc.local is used as you know it. You can change the services started at boot with the help of BUM. Uncheck the box and click Apply. 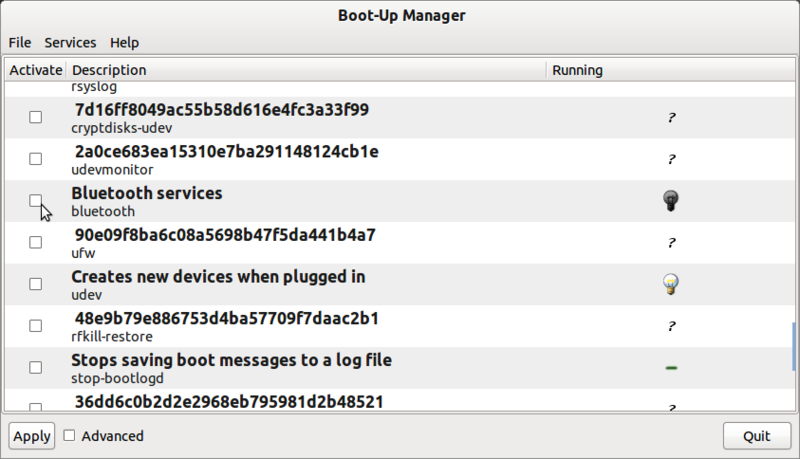 before "exit 0" command for boot with bluetooth turned off. sudo sh -c "echo 'manual' > /etc/init/bluetooth.override"
That works for Ubuntu 13.10 and probably for earlier versions as well. In Debian Wheezy. Check out man update-rc.d for more info on how to use it. No. It is not always in the startup applcations list. I think that the best solution is to add the rfkill command in rc.local script or to set the InitiallyPowered parameter in /etc/bluetooth/main.conf. On Ubuntu 16.04, I simply disabled the service from starting up using systemctl. If you're using the Bluetooth applet in the top panel (blueman-applet), it has its own setting that will automatically turn Bluetooth on even if you've disabled it in other places (like /etc/bluetooth/main.conf or /etc/default/tlp). I using Sputnik Kernel, which fixed this on my Dell Inspiron 14R N4110. In my set up (Ubuntu 14.04, Thinkpad W540), no option worked inserting it in /etc/rc.local but the former did work in bashrc. Note this will work just for the current user, not globally for all users. Here you can click in the field to disable it. So this device is not powered on startup. So this device is disabled on startup. Then open Dash and search for "Startup Applications". Uncheck any items related to Bluetooth in the list. Click [Close] to save. Now bluetooth will be disabled on each boot. After changing this configuration bluetooth will can be enabled and disabled through menu and panel item. I think it's better than removing it from kernel modules. "BIOS - USB Configuration - EHCI2 : Disabled"
I had to use a brute-force method to stop bluetoothd from being automatically started at boot. I renamed the executable so it couldn't be found. You need to disable it from the Start Up Applications list in System Settings. Click on the cog in the top right hand side of the menu bar and then select System Settings. Click on Start Up Applications then scroll down until you find the bluetooth setting, take the tick from the box and you all done. Not the answer you're looking for? Browse other questions tagged startup bluetooth services or ask your own question. How to turn off bluetooth? How do I disable bluetooth startup (by default, with every boot) in 17.04? Do not start bluetooth automaticaly. How to do that? How to disable bluetooth on startup Ubuntu 18.10? rfkill block bluetooth disables wifi too? How do I find Bluetooth in my BIOS?